The exterior of our homes is the first impression that people get. Whether they’re visiting or a neighbor, you want to make sure that your home is giving the right impression. While it may not seem like the most important part of the exterior of your home, your driveway is one of the many things that you need to stay on top of in order for your home to look great. In today’s blog post, we’re going to touch on a few of the ways that you can maintain a driveway that looks great but also provides you with an easy drive and a great place to park. The points that we’ll cover below should also help minimize the chances of any serious damage happening to your driveway — which is something that happens when a driveway is neglected. Your driveway is outside, so the thought of keeping it clean might sound a little bit ridiculous, challenging at the least. While many people will scoff at the fact that driveways need to be cleaned, the reality is that cleaning your driveway can do so much more than making it easier for you to drive in. That’s why our first maintenance tip is going to be cleaning! Whether it’s snow that’s piled up or oil that’s leaked out, staying on top of cleaning your driveway is something that needs to be prioritized. Not only can debris that is left behind lead to stains, but it can lead to accidents too. Make sure to clean up any leaks, standing water, branches or leaves that could affect your driveway. Staying on top of repairs is the next point of maintenance that we’re going to touch on. With time, mother nature is going to take a toll on your driveway. Here in Bucks County, we get some curious weather that can leave our driveways with some severe damage. From cracks to potholes, it’s crucial that you complete repairs as needed. 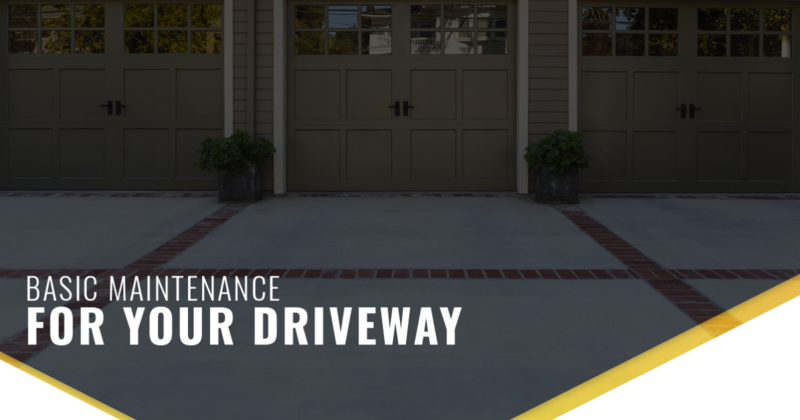 Sure, it’s not ideal to have to complete repairs on your driveway, but the sooner that you get them taken care of, the less damage they’ll be able to do in the long run. You see, the longer that a crack goes without being taken care of or a pothole without being filled, the more accessible the foundation of your driveway is to the weather that created the damage in the first place. By staying on top of needed repairs, you keep your driveway in prime condition and prevent any further damage from happening. Having a team of professionals come out to your property and take a look at your driveway can be extremely helpful. Not only will they be able to provide you with some insight on what your driveway needs, but they’ll be able to get the job done. If you’re in need of a team of professionals to help out with the driveway (or any other pavement) at your Buck County home, count on Harrison Paving! We have been fortunate enough to provide the Buck County area with high-quality service and beautiful pavement projects for over 60 years! Reach out to us today, and we’ll get you taken care of.